Flower: generally open evening, closed daytime. Chromosomes: 2n=18. Citation for this treatment: Robert Patterson & J. Mark Porter 2015, Linanthus dichotomus subsp. 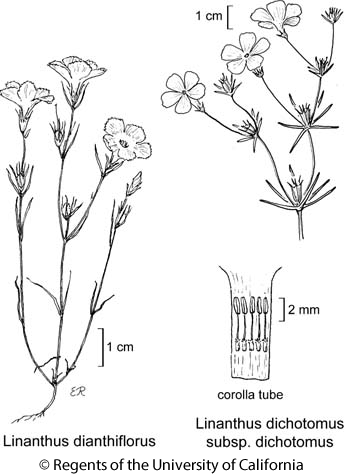 dichotomus, in Jepson Flora Project (eds.) Jepson eFlora, Revision 3, http://ucjeps.berkeley.edu/eflora/eflora_display.php?tid=51286, accessed on April 26, 2019.